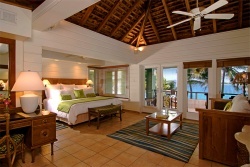 Harmonious & Elegant If you’re a fan of retro-elegant architecture but also crave upscale amenities (except for TV), look no further than Rosewood Little Dix Bay. This legendary resort, set on a pristine half-mile crescent beach on Virgin Gorda, was founded in 1964 by conservationist Laurance S. Rockefeller and renovated in 2006. Its 100 rooms, featuring stone walls and high ceilings (pictured at left), are spread over 600 acres. With the summer and fall Rosewood Escapes special, nightly rates start at $395 through August 31 and $325 in September and October. Dine at three restaurants (the Sugar Mill is especially romantic) and book a couple’s massage at Sense, A Rosewood Spa, which is tucked amid blooming bougainvillea on a cliff overlooking the stunning Sir Francis Drake Channel. Private & Pampering Romantics seeking to get away from it all should consider 52-room Peter Island Resort & Spa, located on its own 1,800-acre private island studded with 20 coves and five beaches. For travel through October 31, book a Beach Front Jr. Suite (pictured at right) via the Double Summer/Fall Fun special for just $650 per night (vs. the normal $900), including three meals daily and two-for-one deals on transfers and spa passes (the spa pool, set high on a hill with panoramic views, is tranquility central). More spacious than Ocean View Rooms, the king-bedded Beach Suites have a Jacuzzi for two and a balcony or patio overlooking the shimmering blue water and white sands of Deadman’s Bay – who needs TV? Easy & Breezy Smaller and more laidback is 31-room Biras Creek Resort, where guests hop on bicycles to get around to the 140-acre property’s white sand beach, swimming pool, spa, and two restaurants. White-on-white décor with pastel accents and local artwork create a relaxed ambience. Choose an Ocean Suite for refreshing and melodic seascapes and a Grand Suite (pictured at left) for a private plunge pool and flat-screen TV (if you just can’t give it up). The views are spectacular from the Hilltop Restaurant and Terrace Bar, dawn to dusk. 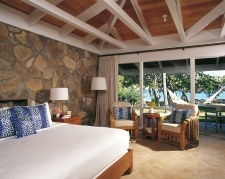 Rates for an Ocean Suite are $850 per night, including meals, through December 17, 2010 and with the 7 Nights For 6 special, you can get a seventh night free plus a $100 resort credit (call 877-883-0756). Find your perfect island getaway with our Caribbean Travel Deals.